Kids, Cows and Grass: Women are ranchers too! 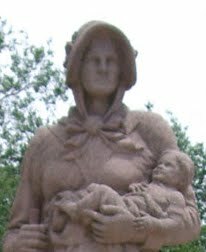 One of my favorite historical monuments is right in my backyard--the Madonna of the Trail in Council Grove, Kansas. Council Grove was an important stop along the Santa Fe Trail and along the trail there are 11 monuments to the pioneer women who traveled that trail. As a kid, we lived nearly an hour's drive from Council Grove, but the town had a great restaurant and lots of history, so I remember touring the town and being very impressed with the Madonna. I had no idea that I would one day live so close to the monument and it would be so important to my life. To me, the Madonna signifies the contribution that women made in taming this prairie and moving civilization out west. She is a tough-looking woman who has a baby in her arms and a child hanging on her skirts, but she is walking along the trail, bringing with her the tools needed to settle in the wilderness. Today, I am a cattle rancher--a partner with my husband in our ranch and we both work side by side to care for our cattle. Our partnership is much like it would have been in the late 1800s when pioneer women worked in the fields and took care of livestock, as well as raised the children, cooked the meals and kept the house. Often, history doesn't recognize their contribution to the farm or ranch, but they were there working just as hard as the man to keep the livestock fed and the crops alive. I don't consider myself a "feminist;" I am not a "woman rancher;" I am not unique. I am a rancher; I do my best to take care of the cattle, our kids and our home. I also happen to be a woman--and there are many like me who do our work every day, because it is the right thing to do--not for any notoriety or publicity. I love ranching--it was a great way for me to grow up, and for us to raise a family now. I have always felt that the matriarchal instincts of women are more suited to ANY breeding program and you my dear are at the top of the list! 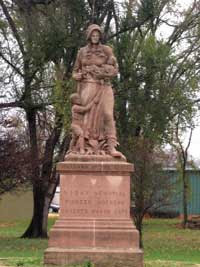 I remember the trips to Council Grove and seeing the Madonna of the Plains, and the sheer power that monument possesses. We are extremely lucky to have been raised a part of the hard work and spirit that our ancestors brought to Kansas. That was a very nice tribute to the pioneer women, and to those of us who ranch with our husbands & kids. Thank you. Well said.